After a couple lackluster years, this season has been a truly spectacular one for apricots. Thanks to their availability, I’ve canned my way through at least 25 pounds of these, the very sunniest of stone fruit. 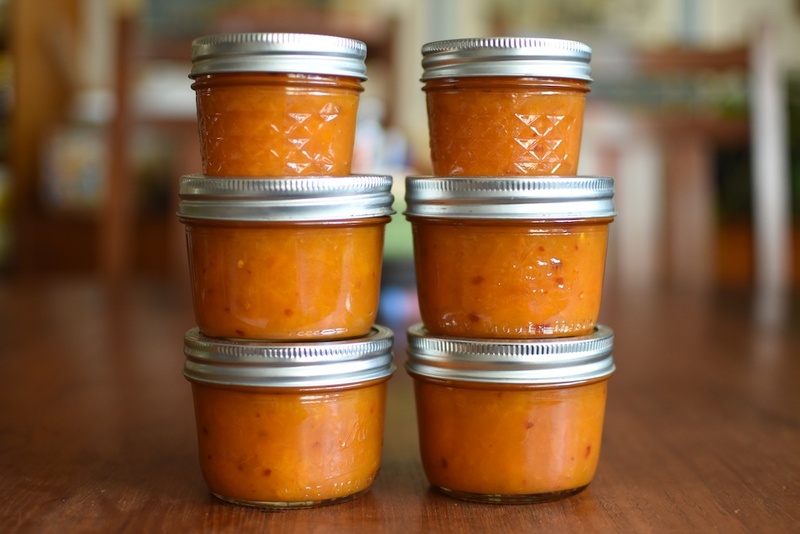 I made a bunch of this basic apricot jam (it’s a little runny but so delicious), there was this batch of sour cherry apricot jam, and then there’s this spicy jam. It’s sweet, spicy, and perfect for glazing roast chicken, using on baked brie, or even on a very grown-up pb&j. If you want to see the making of this preserve in action, I demoed how to make this jam last night on a Facebook livestream. If you missed it, you can find it here. Combine the apricots with the sugar and let them macerate for at least an hour (overnight is even better). When you're ready to cook, prepare a boiling water bath canner and enough jars to hold around 5 half pints of product. Pour the macerated fruit into a low, wide, non-reactive pan and set it over high heat. Add the red chili flakes. Bring the fruit to a boil and cook, stirring occasionally at the start of cooking, and nearly constantly towards the end. The cooking process will take anywhere from 15 to 30 minutes, depending on the width of your pan, the water content in the fruit, and the heat output of your stove. You're looking for the jam to get glossy, for thick layers to form on the walls of the pan, and for the jam to sheet nicely off your spoon or spatula. When it does all that, it will be done. When the jam is thick enough for you, remove the pan from the heat and funnel the jam into your prepared jars. Wipe the rims, apply the lids and rings, and process in a boiling water bath canner for 10 minutes. When the time is up, remove the jars from the canner and set them on a folded kitchen towel to cool. When the jars are cool enough to handle, test the seals. Sealed jars are shelf stable for a year or more. Unsealed jars should be refrigerated and used promptly. Anybody made this with peaches? I’ll be picking up a half bushel tomorrow. That should work quite well! The only difference is that the yield might be less, as peaches tend to be slightly less dense than apricots. I had been looking for a spicy peach jam and, of course, there it was on your website! One question – on your podcast, you used just 1 tsp chili flakes but the recipe calls for 1 Tbs. I made the recipe already and used only the 1 tsp. It was great – nicely spicy but not overpowering. It looks beautiful and my tasting spoon sample was really good. Apricots are high enough in acid on their own that they don’t require lemon juice for safety. And I found this preserve to be plenty tart without any additional acid.